Projects encompasses long term and short term projects; personal, community based, and commissioned. Below you'll find information and links about these projects. The Project: The story of a young prince torn from father's arms and away from the great Kingdom of the Wind. Follow the prince's struggle to retake his kingdom from evil forces in this coming of age adventure story of loss, courage, and friendship. For more on the project as it develops and how to get involved check back here to the projects page. The Project: In collaboration with Red Fish Bowl and Full Pint Brewing, I am designing a painting to fit on a Tap/Draft handle to be placed in a (currently undetermined) bar in Pittsburgh. The official Red Fish Bowl beer "Living Color IPA" will be in a number of bars in the city. 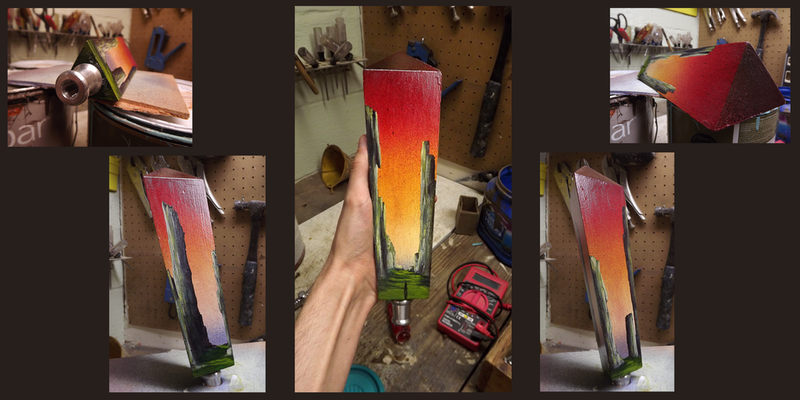 Each tap handle is custom designed and painted by a Pittsburgh Artist. The Challenge: The Project comes with it's own set of unique challenges. First is designing a painting for an unusually shaped object. Second is the nerve of having to make something that is both colorful/eye-catching and something that fits my workflow. Finally there's the challenge of making sure it will last the wear and tear of a bartender's hands. With some advice from a friend I've settled on doing a polyurethane finish, but this is all in the future plans...First I have to paint the thing. This piece was by no means easy. Lots of sanding and layering. I decided to use spray paint give the base color of the piece an more dynamic look. The piece was held up by a couple of bricks as I worked on each side, doing layer by layer to ensure that the composition was uniform across the entire surface. It was certainly a great challenge project, and I can't wait to see it in use in a few months! There's tons of educational content on YouTube but one thing there isn't a solid series on is Art History. From Cave Paintings to Contemporary and everywhere in between, this project will encompass nearly two dozen eras of history and inform the average joe and/or the aspiring artist about the wonders of the great masters. There's a lot of work to be done before I can even start filming on this project. The scripts will likely take several months just to write and the series itself if posted weekly will take the better part of a year. This project is still in it's early stages so be sure to check back as it develops.